Charlton Athletic Online: Living in a Charlton Tinkerland! Living in a Charlton Tinkerland! Charlton’s fourth game in 11 days sees the Addicks travel to Suffolk to take on the Ipswich Tractor boys on Tuesday evening. Earlier in October, Charlton beat Jim Magilton’s men 2-1, thanks to a second half own goal, but since then, the World has moved on and we now know much more than we did back then. What is still quite evident is that Alan Pardew (left) is not getting the best from his squad of players - maybe he should open his eyes? We have seen varying degrees of 4-4-2 (versus Burnley), 4-1-4-1 (Forest), 4-5-1 (Doncaster), and even 4-2-3-1 (Bristol City) formations over recent weeks, often appended at half time when things aren’t going quite the way AP expected. It’s always good to have a squad that is versatile, flexible, and can accommodate various tactics to suit the opposition, but when the team is thrown together without much time to work on how each part of the side integrates, then it is asking for trouble. Then there are the players: How does Izale McLeod feel this morning? Thrown into an important game after just 90 minutes reserve action since February, hauled off at half time, and all because he was expected to be a world-beater. Of course it wasn’t going to happen for him on Saturday and not many of us would have expected it to. 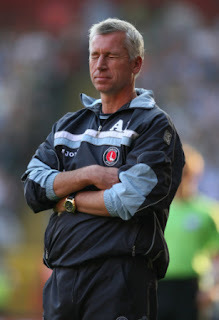 So why did Alan Pardew see McLeod as the way to restore the goal scoring edge to the Addicks attack? Why not give Chris Dickson a go from the start – at least he was fully fit! Dickson has been fit all season so far, yet apart from the odd ten minutes here and there, when Charlton have been chasing a game, he just hasn’t had a look in. Why did McLeod (left) get a chance in front of him on Saturday? You can actually go through much of the squad – or those who are not seen as special ones, like Ambrose, Hudson, Crainie, etc – and see how badly they have been treated. Yassin Moutaouakil has one bad game and then is out on his ear for two months, even when his replacement (Martin Crainie) is so poor in that position he is getting hauled off at half time (twice). Or Kelly Youga, who on Saturday was the full back on the other side who got an afternoon off so Crainie could play (even worse) at left back. How about Hameur Bouazza, a winger who had more shots in Charlton’s defeats at Cardiff and versus Bristol City than any other player (OK, not many troubled the keeper…) but then gets demoted to the bench while Grant Basey fills his place for a half befor the tactics changed. Matt Holland may be getting a bit old for four games in quick succession, but he seems to be the latest scapegoat, having been initially dropped for Zheng Zhi in the first Ipswich game, and then on Saturday for debutant Josh Wright. Then there’s Jose Semedo, the star of the Valley Ipswich game (in the 45 minutes he got on the pitch), and unlucky not to have played at Cardiff from the off. Suffice to say that his sending off in that game will see him struggling to get into the match day 16 for a while unless injuries hit home - from hero to zero, through "an unlucky red card" (Pardews words...). At least Andy Gray had an excuse not to play on Saturday (nursing a sick relative), otherwise he was another who could be added to the list of those not expected to be very happy with being left out. So you see it’s probably not just us fans who are getting a bit annoyed with decisions made by Alan Pardew, but the players are too. Is it just a matter of time before the board start to react and votes of confidence start to dry up? The board can Join the Redvolution now if they want…it's not an exclusive club! So Charlton march onwards but not yet upwards, struggling to put together not just a good game, but a good half. Sure, twenty-five minutes versus Bristol looked good, and so did parts of the second half on Saturday, but when will Pardew get the right team on the pitch from kick off, playing to the right tactics? How long does it take to get it right? At Portman Road, Pards can at least continue to have Nicky Weaver in goal; Weaves is doing OK, even if not being too spectacular. I’m one who didn’t think he got a touch to Gudjohnson’s second half shot which crashed back from the cross bar on Saturday, but if he did, then it was a very good save. Pardew has said that Moutaouakil will play again, and skipper Mark Hudson is also guaranteed a place. Then it starts to get interesting; should Linvoy Primus be played - after he did well in the first Ipswich match – or should his second half replacement on Saturday Crainie be used in his most obvious and best position? And if Crainie plays centrally, does Grant Basey carry on at full back or does Kelly Youga earn a quick recall? In midfield, Darren Ambrose is sure to start against his old (and possibly future?) club, as is Nicky Bailey if he is fit. Lloyd Sam did enough on Saturday as substitute to keep his place wide right, but does Holland or Wright start centrally? Presuming we play two up front, is Svetislav Todorov fit enough to play from the start, or will he be a substitute again? Can Luke Varney carry on missing gilt-edged chances, or will he be spared, and if he is, will Gray be available or will we see either Dickson or McLeod given a chance? All of a sudden, from having a relatively settled team, we are now right back in the world that Pards loves – Tinkerland! Subs from Eliott, Semedo, Primus, Basey, Wright, Bouazza, McLeod, Dickson, Todorov. The eleven gives Pardew enough option to play 4-4-2 or 4-5-1, with Ambrose wide left in the former, and centrally with Varney on the wing if we have to play tighter. Importantly, it also looks like a decent team on paper! If Gray is not available, I would play Dickson from the start – he cannot do any worse than McLeod did on Saturday! That’s what tactics are Pards, and picking a team to do the required job is part of your responsibility. The bench, if picked correctly, also gives plenty of option to change should the need arise; Todorov was at his best when joining the action later on Saturday, and I would hope that the same will be true again tomorrow. Ipswich are coming off the back of a good win on Saturday, so will be full of confidence. Kevin Lisbie scored again on Saturday, so he could well start against us in this game (Note to defence – he likes to run across the six-yard box at corners and flick the ball in with his head; please try to defend!). The rest of the Ipswich team are almost equally well known, so we shouldn’t be surprised by anything that they decide to come at us with. What we can do is surprise them with our improvement! Pedro45 has little faith in Pardew at present, although I do have unerring support for the club. I would love to be more positive and hope for a win, or even a draw, but I cannot see it – my score forecast is a 3-1 defeat. I do think we have a chance to score, but I’m not sure that we have enough heart to prevent them scoring, and once the heads drop, that could be curtains in the search for any points. 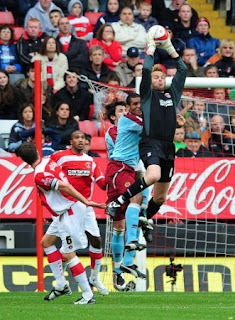 My one-to-watch in this match is going to be Nicky Weaver (left). The only hope Charlton have in any game at present is when this man plays a blinder – if the Addicks are to get anything in Suffolk this season, Weaves will need to be at his best – catching crosses, stopping shots, and cajoling the defence into marking and tackling and covering whenever necessary. If he gets injured, we could be in even more serious trouble come the end of November than we are now. It would be so nice if we could turn around and say that last Saturday was the turning point; the catalyst to a better season; the time when we could go no lower; when we started to pick up points; play with purpose, and to tactics and formation that the players understand. I’m easy with 4-5-1 or 4-4-2 Pards, just make your mind up and pick the right team to carry out your plans. If Pardew starts to do that, then at least we can see where he is trying to get us, and not pushing all of the buttons at once just trying anything to get the correct formula. Spot on. Given the lack of funds Charlton now need someone that can make the most out of the playing resources that we have. We need a good man manager and that is clearly not Pardew. We don't play as a team and the confidence of the players is being shredded by poor tactics and constant changes in selection. It's difficult to think of a first team player that is progressing under Pardew and our coaching team. We do need to change our manager. Sooner rather than later.